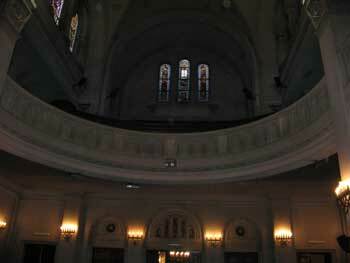 The sanctuary of the Libertad synagogue in Buenos Aires. Image courtesy of the Jewish Virtual Library. When I was an MFA student at Bennington, I spent six months studying Jewish literature with my advisor David Lehman. (The paper I wrote that semester is fifteen years old now and I'd revise it if I had the time, but if you're curious, it's called Nu: what makes Jewish literature so Jewish, anyway?) During that six months I read all sorts of poetry and prose, including two volumes in the Jewish Latin America series edited by Ilán Stavans (who I heard speak at Williams a few months ago.) Novels including Cláper (Venezuela) and The Jewish Gauchos of the Pampas (Argentina) reminded me that the Ashkenazic immigration story familiar to most North American Jews is paralleled by the story of Jews immigrating to South America, many to Argentina. My great-aunt Vera (of blessed memory) and great-uncle Carlos emigrated to Brazil and lived there for many years before coming to the States. (My middle name, Evelyne, honors their daughter who died when I was a child.) And the grandmother after who I am named emigrated to Mexico and came to San Antonio once she became engaged to my grandfather who already had residence in Texas. So I'm keenly aware that Jews who left Europe came to the Americas through doors other than Ellis Island (see the Galveston Movement)... and went to places even further south than San Antonio where I was born and reared. But since I read those books at Bennington I hadn't thought much about the Jews of Argentina, until we planned a vacation there. 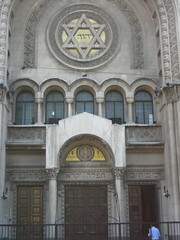 Buenos Aires is home to a sizeable Jewish community, including many synagogues and even a rabbinic school (associated with the Conservative movement, it's the only rabbinic seminary in the southern hemisphere.) Before we left on our vacation I did some reading about Jewish Argentina, and promised myself that I would try to daven b'tzibbur (with a community) while we were there. The day before we left the country, I went to daven shacharit at Argentina's oldest synagogue, Congregacion Israelita de la Republica Argentina (CIRA -- here's their Spanish-language Wikipedia entry, since the English one is pretty paltry) also known as "Libertad" because it overlooks a small plaza of the same name. According to the Fundación Judaica, CIRA was founded in 1862; the current building was constructed in 1897 and remodeled in 1932. I must have been the tenth person to arrive. I got there around 10am, expecting the service to be well underway, but found instead a handful of people chatting in Spanish in the enormous ornate sanctuary. In front of us, a half-dome adorned with gold mosaic spelled out the words of the shema, topped by a round stained-glass window featuring a star of David. Above the ark I could see the workings of a massive pipe organ. About three minutes after I got there, the small crowd moved to the pews at the front of the room, and beckoned for me to join them, and began to sing. The service was entirely in Hebrew, which was great, because my liturgical Hebrew is much more fluent than my conversational Spanish! The person leading periodically called out page numbers in Spanish, which I was sometimes able to follow but other times not. Thanks to DLTI, I know the matbe'ah tefilah (structure of the service) well enough to be able to navigate even an unfamiliar bilingual siddur. At first I thought the davening was lay-led. Different pieces of the service were led by different people, all from the pews; no one set foot on the bimah until the Torah service began. One man played hand-drum (extremely well; later he would step onto the bimah and play a small electronic piano to accompany the removal of the Torah from the ark.) Three men and one woman led different parts of the service, shifting leadership between them with ease. I recognized some tunes (the "Elohai Neshama" was one I first learned at Elat Chayyim years ago, and hearing it again felt like encountering an old and dear friend) but others were new to me, fast-paced and rhythmic. A couple who will be married this week were honored with the opportunity to remove the Torah from the ark. I saw maybe six Torahs in the ark when it was opened. We used a tiny one, which was carried around to everyone at the beginning and end of the service by the engaged couple, as a way of honoring them in the days before their chuppah. After the Torah reading, a man lifted it effortlessly for all to behold and then a little girl of maybe eight or nine dressed it in its velvet robes again. The Torah service consisted of seven aliyot, in the classical Conservative mode, though each one was quite brief so it went quickly. I was honored when the gabbai came to me and asked for my Hebrew name so that they could give me an aliyah. On the bimah there was a laminated card with the Torah blessings written on it in transliterated Hebrew. This is common in shuls in the US, too, but the Spanish spelling ("Baruj ata," etc) was oddly disorienting to my eyes. (Fortunately I was able to ignore what was written on the card in front of me, and just chant the Hebrew words I know.) The engaged couple was called up for an aliyah, too. Members of the congregation held a rainbow-striped tallit over their heads and we sang a song of joy and good fortune to bless their coming union. After an abbreviated haftarah (reading from the Prophets), we sped through a musaf (additional) amidah and then moved into the ramp-down of the service. The man in the pink shirt, who I'm pretty certain was the community's rabbi, offered a brief d'var Torah in Spanish. My Spanish isn't so great (and Argentine Spanish turns out to be quite different from the Mexican Spanish of my childhood, at least to my untrained ear) but I understood him to be speaking about Pesach, which is coming soon. Pesach is when we read Song of Songs, and the tradition understands it as our festival of spring. Of course, in the Southern hemisphere these days are the beginning of autumn! But, he said, we can still celebrate the springtime of our lives during this season, as do this couple who will be married in a few days. Before I left, I chatted briefly with the man in the white shirt and white kippah, whose English was fortunately far better than my poor Spanish. I wanted to thank the rabbi for welcoming me, but he was deep in conversation with the other visitor of the morning -- a man from Singapore who belongs to the Jewish community there -- so instead I wished the fiancés mazal tov and said a heartfelt muchas gracias to everyone I passed on my way out. What was most wonderful for me was the chance to experience something intimately familiar (the traditional Shabbat liturgy) in a setting which was entirely new (the huge beautiful sanctuary; melodies which I hadn't heard before; fast-paced Hebrew inflected with Spanish sounds.) This makes a powerful case for preserving Hebrew as our language of prayer: it is amazing to be able to go anywhere in the world where Jews gather, and to be able to join in praising the Holy One of Blessing in the same familiar words I've known all my life. Meister Eckhart is said to have remarked that the first and most fervent prayers are "please" and "thank you." Davening with the Concregacion Israelita de la Republica Argentina definitely offered me many reasons to say thanks. Thanks, CIRA, for a wonderful chance to daven in your midst! These don't merit a whole post, but I figured I'd toss the links in here. For those who are interested, here are my four Argentina photosets: Buenos Aires | Patagonia | A day on the glacier | Colonia del Sacramento. 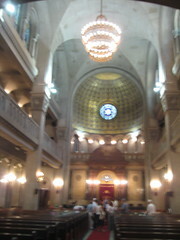 Technorati tags: Argentina, BuenosAires, CIRA, synagogue, Shabbat.